Published reference intervals for Freelite and N Latex FLC assays are similar (Table 8.5) . In contrast, the Seralite-FLC reference interval for the κ/λ sFLC ratio is significantly higher than the Freelite diagnostic range (p=0.017), and the use of a 90% range may result in a higher false-positive rate for the Seralite-FLC assay . Sebia FLC reference intervals for κ and λ sFLC concentrations and the κ/λ sFLC ratio are all slightly narrower than Freelite ranges . Freelite assay standardisation and normal ranges are further discussed in Chapters 5 and 6, respectively. Table 8.5. A comparison of reference intervals for Freelite, N Latex FLC, Seralite-FLC and Sebia-FLC assays. Figures in bold indicate the limits for result interpretation. The diagnostic range includes 100% of the reference population. Figure 8.5. Comparison of sFLC results for Freelite and N Latex FLC assays in patients with renal impairment. (A) κ sFLC (B) λ sFLC. Purple line is y=x. (Courtesy of J. F. M. Jacobs). Figure 8.6. Box and whiskers plots comparing Freelite and N Latex FLC results for (A) κ sFLC, (B) λ sFLC, and (C) κ/λ sFLC ratio in patients with renal impairment. Boxes: 2.5 – 97.5 percentile ranges; bars: min – max values; dotted lines in (C): min – max of normal reference intervals; #: significant increase from control group; ##: significant decrease from control group; *: significant difference between Freelite and N Latex FLC assays (λ sFLC). $: significant difference between Freelite and N Latex FLC assays. (Courtesy of J. F. M. Jacobs). Figure 8.7. Percentage change in sFLC results in patients with renal impairment compared to controls. (A) Freelite, (B) N Latex FLC. Patients with renal impairment but no evidence of monoclonal gammopathy may have κ/λ sFLC ratios (measured by Freelite) which are slightly above the normal range . The reason is that as renal clearance of sFLCs declines, the sFLC concentrations increase to more closely reflect the production rates, which are higher for κ than λ FLCs. Consequently, a modified renal reference range for the Freelite κ/λ sFLC ratio (0.37 – 3.10) has been proposed . Use of the Freelite renal reference range when screening for monoclonal gammopathy in patients with renal impairment may increase specificity and is further discussed in Section 6.3. Lutteri et al. studied sFLC concentrations in chronic kidney disease (CKD) patients using the Sebia FLC ELISA. Progressively higher sFLC concentrations and sFLC ratios were associated with increasing renal impairment, and the authors concluded that renal reference intervals should be developed for these assays. A subsequent publication by the same group  defined a renal reference range for Sebia FLC ELISAs based on analysis of 151 serum samples from CKD patients (0.46 – 2.23). The authors propose that this range is used for patients with any degree of renal impairment (CKD stage 1-5). Jacobs et al. studied the effect of renal impairment on N Latex FLC concentrations in 284 patients with CKD (stage 1-5). 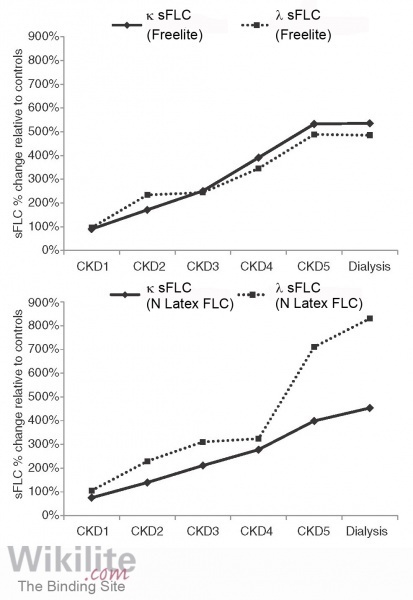 κ and λ FLC concentrations increased through each CKD stage. 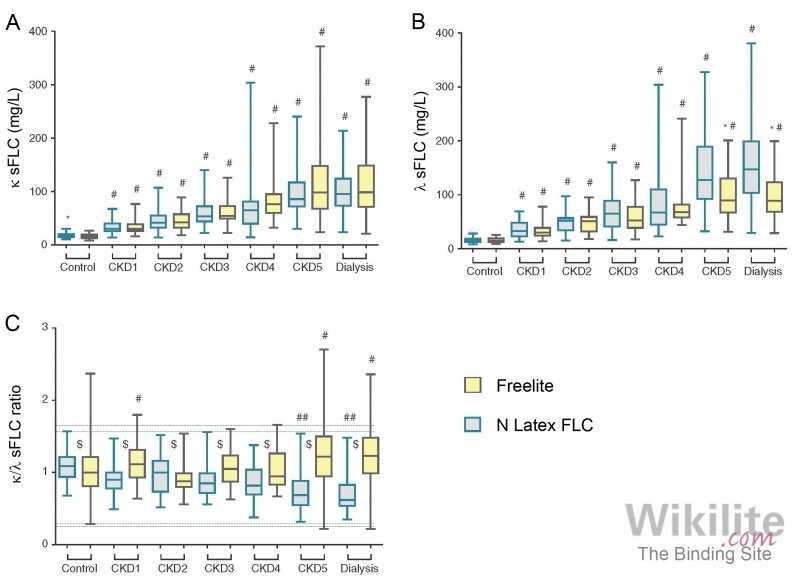 However, whilst κ N Latex FLC assays gave similar results to Freelite, the increase in λ FLC concentrations in the CKD5/dialysis groups was significantly greater for the N Latex FLC assays (Figure 8.5, Figure 8.6A, Figure 8.6B). As a result, none of the patients with CKD had a κ/λ sFLC ratio exceeding the N Latex FLC reference interval and, in fact, the ratio was significantly lower in the CKD5/dialysis group compared to healthy controls (p<0.0001; Figure 8.6C). Berlanga et al. re-analysed the data reported by Jacobs et al., and plotted the percentage increase in sFLC levels relative to controls for both assays (Figure 8.7). Freelite measured a progressive elevation of κ over λ FLC with worsening renal function, which resulted in some patients having an abnormal κ/λ sFLC ratio. 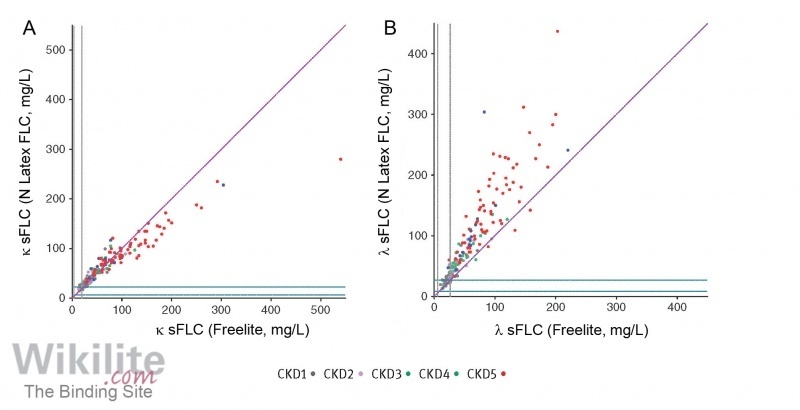 By contrast, N Latex FLC assays indicated an approximately equal increase of both FLCs throughout CKD1-4, but a sharp increase in λ FLC levels in the fifth group, that comprised both CKD5 and dialysis patients. Similar findings were reported by Kennard et al. who compared pre- and post-hemodialysis sFLC concentrations in 105 patients with end-stage kidney disease and no known lymphoplasmacytic disorder. Pre-dialysis λ sFLC concentrations were much higher as measured by the N Latex FLC assays than Freelite, but post-haemodialysis, a larger reduction in λ sFLCs was indicated by the N Latex FLC assays (Table 8.6). This resulted in similar post-dialysis λ sFLC concentrations as measured by both assays. One possibility proposed by Tate et al. is that in end-stage kidney disease, λ sFLCs are mainly monomeric, and these monomers are readily cleared by dialysis. As the N Latex FLC assay preferentially reacts towards λ FLC monomers (Section 8.6.1), this would explain the higher initial λ sFLC values and more dramatic fall in λ FLC concentrations measured by these assays. Table 8.6. Comparison of Freelite and N Latex sFLC concentrations pre- and post-haemodialysis. Median (interquartile range, IQR) values are reported . There is only one published study to date that describes the use of the Seralite-FLC assay in patients with renal impairment: Heaney et al. characterised Seralite-FLC sFLC concentrations in patients with new dialysis-dependent renal failure (AKI stage 3) due to causes other than MM. Similar to N Latex FLC assays, patients with renal failure had a lower Seralite-FLC κ/λ sFLC ratio (0.2 – 1.3) than healthy donors (0.5 – 2.5), due to an increase in λ sFLCs relative to κ sFLCs. Using ROC analysis, the authors define optimal cut-offs for the Seralite-FLC κ/λ sFLC ratio to identify κ (>2.02) and λ (<0.14) MM patients presenting with renal impairment. However, it should be noted that these cut-offs were developed using only the subgroup of MM patients classified as AKI stage 3, and therefore further validation is required before they can be more generally applied. In summary, FLC assays based on polyclonal antisera (Freelite, Sebia FLC) require the use of renal reference intervals for CKD patients, whereas assays based on monoclonal antibodies (N Latex FLC, Seralite) report significantly lower sFLC ratios in patients with renal impairment that are covered by their respective normal reference intervals . This may reflect differences in the reactivities of the reagents towards FLC monomers and dimers, which is discussed in Section 8.6.1. 4. Jacobs JFM, de Kat Angelino CM, Brouwers H, Croockewit SA, Joosten I, van der Molen RG. Evaluation of a new free light chain ELISA assay: Bringing coherence with electrophoretic methods. Clin Chem Lab Med 2018;56:312-22.